Experience Tokyo by the seat of your bicycle on this guided bike tour through Edogawa. Located at the city’s east end and facing Tokyo Bay, Edogawa is an area rich in natural surroundings. During your 6-hour tour, you’ll visit several beautiful local parks, including Gyosen Park, Kasai Rinkai Park and Tokyo Sea Life Park, stopping for photo ops and ending around Tokyo Disney Resort. Enjoy personalized attention on this small-group tour, limited to 10 people. Meet your guide at the Edogawa Municipal Baseball Stadium around 9:30am and hop on your comfortable bicycle for a fun 6-hour tour — great for all levels of riders, including beginners. Follow your guide around Edogawa and explore this oceanfront residential area of Tokyo with your small group, stopping at top attractions along the way. 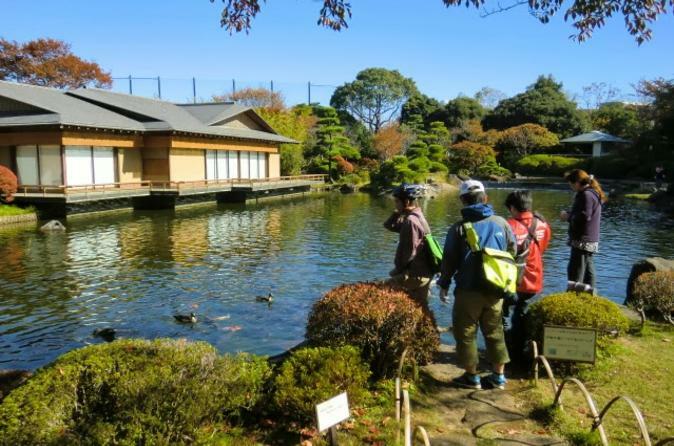 First, bicycle to Gyosen Park, known for its beautiful Japanese garden called Heisei Garden. Your guide will point out the plentiful flowers and Sakura trees, as well as a zoo and playground. Embark on ride over the riverside cycling road, a paved bikeway that offers great views along the riverbank. Stop by a large supermarket to purchase lunch (own expense) on your way to Kasai Rinkai Park, which features Japan’s biggest Ferris wheel. You’ll enjoy a picnic with your small group around 12:30pm, along with many families enjoying a day off at the famous park. Afterward, head to the Tokyo Sea Life Park for a visit to this amazing aquarium. Here, find marine mammals and other sea creatures on exhibit as you take a look around. Watch bluefin tuna swim inside a huge, donut-shaped tank and be entertained by the antics of several penguin species. Then, hop back on your bike and cross the Edo River. Pedal along the edge of the Tokyo Disney Resort, stopping to take photos at beautiful spots along the way. Your bike tour ends around 3:30pm at Ikspiari in the Disney Resort. Your guide will provide directions to your next destination or you can explore among the 140 shops and restaurants here on your own.